In the 19th century, recessions inspired paintings on a variety of economic themes. As America's economic might surged in the last half of the 19th century, culminating in the Gilded Age, a growing class of wealthy industrialists wanted fine art to furnish their grand homes. Elegant portraits, verdant landscapes, and lush still-lifes were popular, and such artists as John Singer Sargent, James Abbott McNeill Whistler and Thomas Eakins obliged. But Americans also suffered hardship during those years, weathering at least four financial panics—in 1857, 1869, 1873 and 1893. Some artists weighed in with works commenting on the recessions and the financial inequities they produced. "Taxing Visions: Financial Episodes in Late Nineteenth-Century American Art," which is on view through Dec. 19 at the Palmer Museum of Art at Penn State University and then travels to the Huntington Library near Pasadena, Calif, showcases that strain of American art. Fortunately, the exhibition itself is not depressing, for as the catalog notes, artists knew that their paintings could not be too "squalid," or they would not sell. Some, then, put a hopeful gloss on their works, while others injected humor and still others settled for straight reportage. 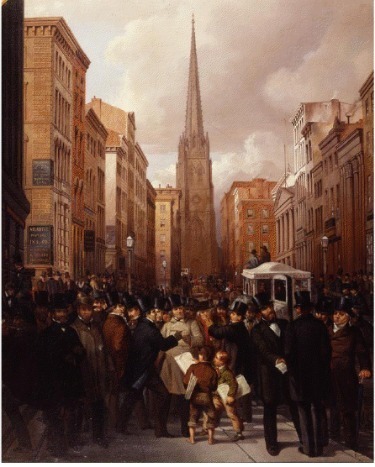 A better scene-setter, portraying cause and not effect, is just a few feet away, in "Wall Street, Half Past Two O'Clock, October 13, 1857" (1858) by James Henry Cafferty and Charles G. Rosenberg. In this great urban scene, the banking crisis and market crash had begun, and traders, tycoons and people from all over New York City had rushed into the downtown streets. At the center of the narrative, the artists placed two newsboys, whose message ripples through the crowd, changing the looks on faces known and unknown (Cornelius Vanderbilt stands on the far right, for example). That crisis, and later ones, wreaked their greatest harm on the subjects of many pieces that follow—working men, women and children. The paintings themselves often seem sentimental and benign—with few tatters in sight—until you realize that the sad little girl in John George Brown's "Buy A Posy" (1881) has probably been selling for hours. Her head tilts back, at the same angle as the flowers in her hand, and her eyes implore the viewer to buy one of the many bouquets she has left. Please. Similarly, Mr. Cafferty's "The Weary Newsboy" (1861), with many more papers to peddle, leans dejectedly against a wooden box, knowing he can't go anywhere until he sells them. And the urchin in David Gilmour Blythe's "A Match Seller" (c. 1859) hungrily devours an apple, a full basket of match boxes at his side. These street children, dependent on their wits and their work for support, deliver a message that's hard to ignore. Among the adult sufferers, one standout is Frank Moss's Rockwellian "A Difficult Job" (undated). 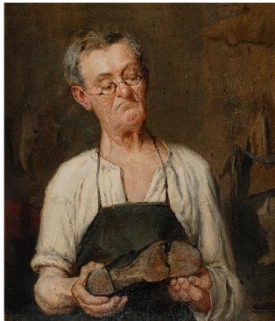 It depicts a cobbler pondering how to fix a sole that is broken in two. "Perhaps tellingly," writes Kevin M. Murphy, one of the show's curators, "his frown repeats the arc of the shoe, as if the former is a result of his unrelenting labor on the latter." Yet it's the shoe's owner, off-sight, who elicits more sympathy. Also unseen are the seller offering William Harnett's "Job Lot Cheap" (1878) and those who placed items in Rose Hartwell's "A Corner Window in a Pawn Shop" (1893), an unfocused, motley arrangement that is one of the weakest works in the exhibition. For its size—about 30 academically informed, narrative paintings and a few etchings, including one of beggars by Mr. Whistler—this exhibition covers a lot, indeed too much, ground. The have vs. have-not dichotomy surfaces in a few works, like Thomas Waterman Wood's "Crossing the Ferry" (1878) where the upper classes reach into their pockets and purses to give coins to a waif playing a violin; and in "Evading the Excise Law—Laying in Rum for Sunday" (1867), an engraving by Stanley Fox that depicts a Saturday night scene in a New York rum shop (and is the only actual reference to taxes in this preincome-tax era). The male vs. female experience is shown in Charles Knoll's "Panic of 1869" (1869) depicting a ruined businessman hiding his face from the news while his wife, a baby at her feet, holds his hand and looks away. Westward flight is represented by William de la Montaigne Cary's "Pikes Peak's or Bust." And the famed election of 1896, with its debates on monetary policy and the gold standard, is immortalized in Victor Dubreuil's "The Cross of Gold" (1896) five currency notes nailed to a brown wall. And that's just a sampling; the works whirl through a dizzying array of topics. Perhaps that is because the show itself was the victim of the current recession. Originally, it was conceived as an exhibit of about 70 works, with a catalog—now about 75 pages—longer by 200 pages. Shrunken by the times, it's quirky and uneven, but it does remind viewers of this neglected genre of American art.